This day had been in his cross-hairs for months. but not to just do his best. He had a plan, had good reasons for winning, and was driven to do so. I've been fortunate enough to row with him for many years. 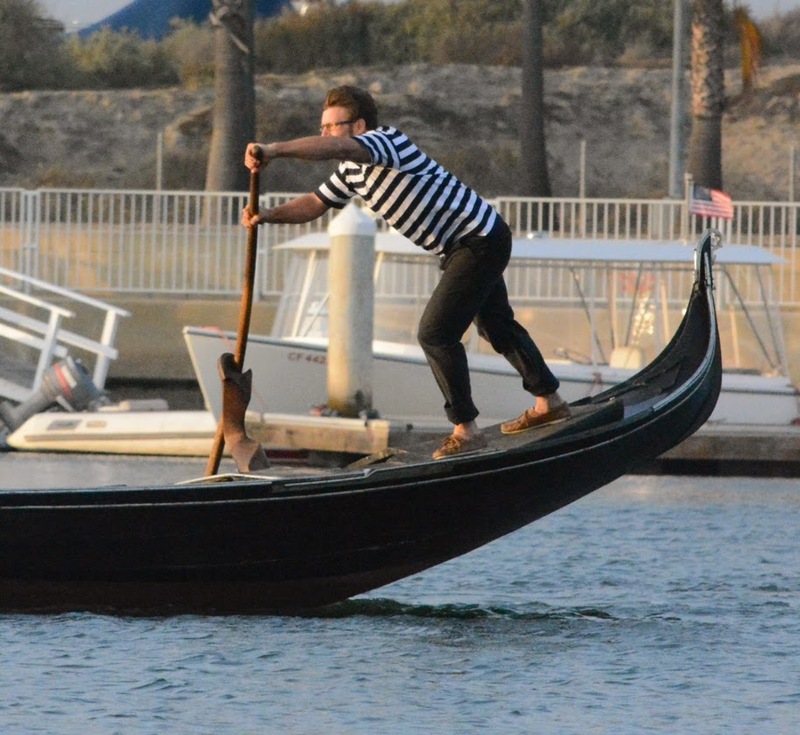 Like just about all gondoliers, Stefano is one of the most interesting people out there. He's skilled in many disciplines and very physically fit. Having watched him on the water, I knew he had a good chance of winning. The race: the solo distance event - arguably the most difficult rowing competition in the 2013 U.S. Gondola Nationals. and with two or more on a boat, the burden of keeping the boat on course is shared as well. Row the race alone, and it's all you. The wind blows, you correct. The boat spins, you stop it. Oh, and then there's the mile and a half of water you've got to push the boat through. to get in front of you. Mastery of every discipline of Venetian rowing is required to compete here. It's no surprise that an authority on the subject once identified single-oared regattas as "the university of Venetian rowing". The minute Stefano learned of this race, he set his sights on winning it. We have our dreams, our plans, we come up with ways we think we can get them accomplished, but things don't always go according to plan. Stefano knew he had to think of his family first. More work meant better security, but it also meant less time to train. When he got the chance to perform in an opera, he had to take the role. Weeks went by with no real training time. All he could do was take the occasional paying cruise to get some rowing time in. His last cruise had been more than a month and a half ago. Stefano told me he'd gotten zero training time. I knew how much this meant to him. I also understood how frustrating it would be for him if he didn't row as well as he knew he could. On Friday afternoon he stepped onto a gondola and rowed a nightmare of a sprint - ending up winded, in the weeds, and finishing far behind the other rower in his heat; it was completely demoralizing. His next run wasn't much better. The gondolier went home that night and told his wife that he would not be winning the race on Saturday. Stefano woke up the next morning at a ridiculously early hour...to run six miles as a pace runner for an L.A. Roadrunners training event for the L.A. Marathon. It was a commitment he had to fulfill, and it was all the way over in Venice Beach, California. He then changed into his stripes and headed for Huntington Harbour. Arriving late, Stefano missed the opening ceremonies but was there and ready when the time came to row his heat. Rowing the boat known as "Fabio" (one of the fleet at Sunset Gondola), he and three other gondoliers headed out to the wide and windy main channel to prepare for the start of the race. When the time came, Stefano rowed as fast as he could to establish a good position. 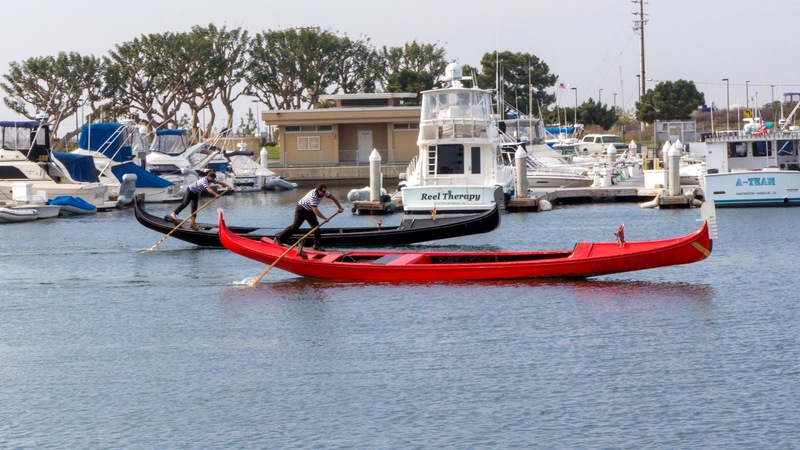 A strong crosswind made things more difficult as he and the other rowers had to keep from getting blown into the yachts that were docked along the shore. Stefano powered down the channel between Trinidad and Humboldt islands. He didn't look back, just kept his focus on a solid pace and an inside line. Another left turn, and he was in the narrower channel behind Trinidad Island. Behind him, Stefano could hear the water pushed from the bow of a boat approaching - more than ever, he knew he had to row hard. so hang on and press on"
The gondolier kept rowing, all the way around the last turn and into the straightaway towards the finish line. Looking back he realized that he had been hearing the sound of water off the bow of a boat...but that the boat was not another gondola, it was a chase boat. The other rowers in the race weren't even in view. He knew he'd won this heat but turned once again to finish it out as fast as he could, knowing that a rower in another heat might beat his time. His strong finish was witnessed by many on the shore. As he beached his boat at Sea Bridge Park, his wife Janette met him with the hero's welcome that everyone dreams of. Nobody rowed faster that day. I'm told that no one even came close. After the second heat, he pulled me aside and asked me to receive his medal for him...because he had an opera to perform in L.A. and wouldn't be able to stay for the ceremony. It was a perfect day for this husband and father of two little girls. His goal accomplished, despite the challenges in achieving it. That night I felt awkward standing up to receive a medal for such a performance, but was honored to do so. 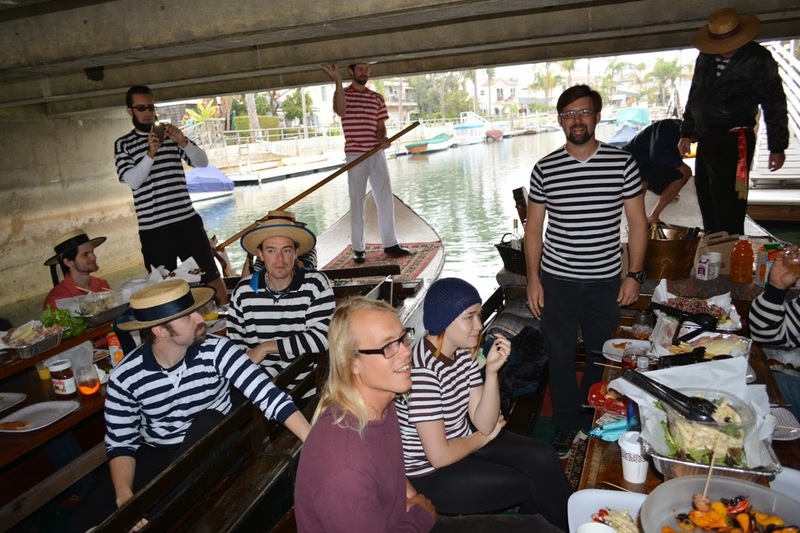 The next morning several of us were hosted by the owner of Gondola Getaway for a breakfast cruise, and Stefano received his 1st place medal in the presence of many great gondoliers who provided the level of applause that was fitting for such an accomplishment. Great! Strangely, this weekend also had another Marathon Man, at the Venice Marathon. The italians are happy about the unexpected 3rd place for their national Lalli. Looks like there is success to be found for the underdogs anywhere, if they try harder than anybody else!